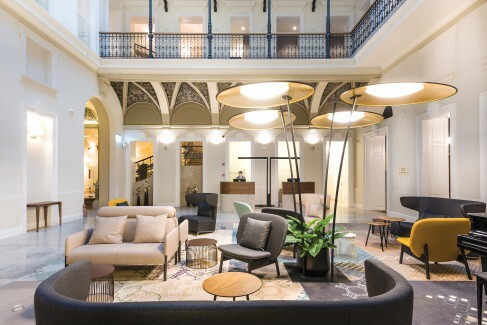 Hotel Moments Budapest, inaugurated in March 2016 is situated at the lower end of the boutique-lined Andrássy út (a World Heritage site). The hotel sits advantageously with St Stephen’s Basilica and the Opera House, both a short stroll away. Juxtaposed perfectly against the hotel’s 19th century features are some delightful oddities like the down lights made from chests of drawers. The building dates back to 1880 and real pride has been taken in the renovation of this former palace. Antiquated frescoes in the glass-topped atrium lobby have been loyal to the character of that epoch, taking many months to paint. Designed by architect Mr Adolf Feszty, a famous Hungarian artist, the hotel boasts of 99 contemporary rooms, a wellness area, a restaurant and even a complimentary tea bar – the perfect mix of modern amenities blended with art-deco history. Juxtaposed perfectly against the hotel’s 19th century features are well- contemplated present day design, including some delightful oddities like the down lights made from chests of drawers in the breakfast area. The unique atmosphere of the lobby has been laid out like a personal drawing room where guests can unwind and relax. Reposing under the amazingly high glass ceiling and old arches, the lobby is brightly peppered with informal furniture that you can sink into after a long day of sightseeing. 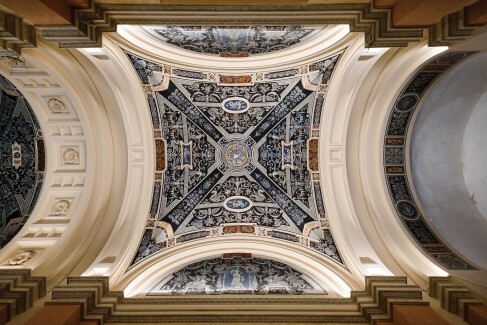 The frescos date back to 1880 and real pride has been taken in the renovation of this former palace. Hotel Moments offers its guests beautifully decorated rooms in three different categories. 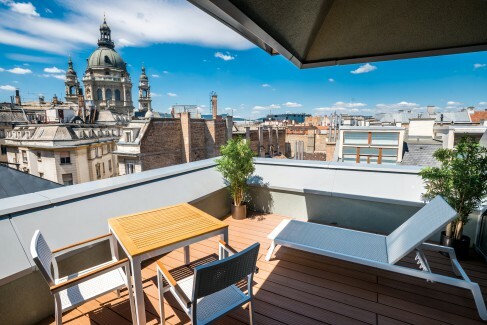 But the spacious “Andrássy Suite” with its astounding view of the St. Stephen’s Basilica, is by far the most privileged. Sitting in the ‘cockpit-like’ private living area of the master bedroom, with the rooftops of the city forming a picturesque postcard view is breath-taking. These viewing windows run though the suite including the bedroom and bath, giving you the feeling of living in the sky. The living, dining and kitchen areas have charming wooden flooring laid-out in a Chevron pattern, while the straight lined modern furniture and leather dining chairs though extremely comfortable, are but accessories to the jaw-dropping panorama outside. 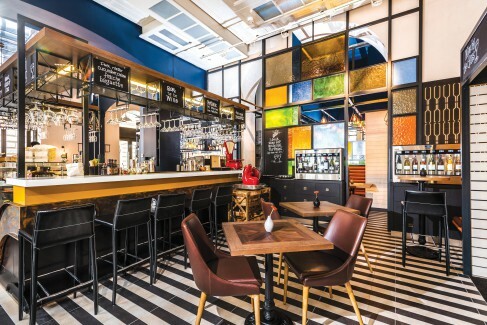 Bistro Fine has some quirky industrial design touches like the ceiling filled with a mix of doors and windows. An earthy palate runs through the master bedroom and connected sitting-area which is padded with a plush black and white patterned carpet that is also reflected in the sumptuous cushions. The bathrooms are sleek all-glass and shiny tile, but the pièce de résistance is the outdoor terrace complete with sun bed and dining table – the perfect place to eat, drink or just dream! The Andrássy Suite has astounding views of the city from its ‘cockpit-like’ viewing windows. 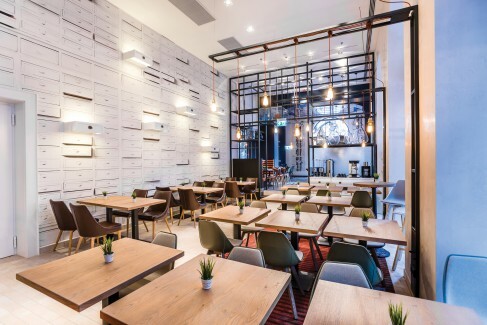 The hotel’s restaurant, Bistro Fine is located partly on the sidewalk and has some lovely industrial design touches with elements signifying Andrassy Avenue. The bar counter represents a smaller version of the underground in Budapest, while the ceiling is filled with an eclectic mix of doors and windows that are typical Hungarian. Not only does the Bistro serve up delicious local food and wine, but the delightful al fresco patio overlooking the avenue is the place to people – watch with a glass of Tokaji in your hand. The bathrooms are sleek all-glass and shiny tile, but the pièce de résistance is the outdoor terrace complete with sun bed and dining table – the perfect place to eat, drink or just dream! This chic boutique hotel managed by the Continental Group, is an excellent pick for holiday makers and business travellers alike. 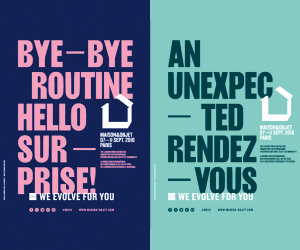 Offering a range of conveniences from spa services to conference rooms (they even have three work stations under a historical staircase) Hotel Moments, Budapest has something for everyone. Photographs Courtesy Hotel Moments Budapest.